Two interesting cases of jaundice presented in past 12 months. Fit 60yr black female deeply jaundiced (painless). Palpable GB. 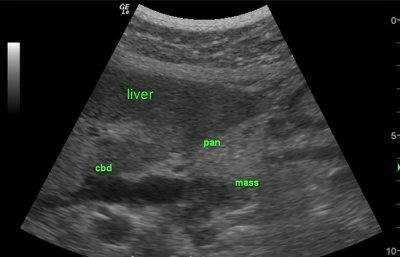 USSCan and CT showed dilated CBD and possible pancreatic lesion, but nothing definite. ERCP showed narrowing of intrapancreatic CBD, not wonderful definition, possible cholangioCA. At surgery the pancreatic head was a little bulky, and going on the likelihood of a Ca in an otherwise fairly fit patient I did a pylorus preserving Whipple’s. Dissecting the specimen afterwards a 2cm Hydatid cyst – unilocular, shelled out of the head of pancreas. It had eroded through into the CBD. Patient made an uneventful post op recovery. Fit 30yr black female deeply jaundiced (painless). Again palpable GB. USScan and CT showed dilated ducts to pancreas, 5cm thin walled apparently unilocular thin walled cyst in region of head of pancreas. ERCP not done (this does involve a several day to weeks wait and a transfer under less than ideal transport 200Km to Durban). At laparotomy pancreas head bulky and slightly fluctuant. Needle aspiration revealed clear fluid from a cyst – no bile. Pancreas showed no signs of pancreatitis. I mobilised the pancreatic head fully and found the lesion nearest to the posterior aspect of the pancreas. I aspirated the cyst as much as possible, and incised the pancreatic head posteriorly, enucleating a thin walled unilocular hydatid cyst. I left a drain in the hole in the pancreas, which dried up rapidly and the patient is now ready for discharge, jaundice rapidly diminishing. There are very few sheep in the area, cattle being the main livestock, with some goats. Hydatid disease is rare here and in 4 years of practise we have had no others at our hospital (catchment area about 2.5 million. I would welcome comments if others have had experience diagnosing and managing hydatids – clearly we didn’t do too well on the diagnostic side. Would you have done a formal drainage procedure of the CBD in the second patient. 2 interesting and good cases, as you say. I agree with your approach almost completely in patient #1, and especially applaud you for not going overboard with diagnostic expensive and useless testing to end up doing what you should do anyway–i.e. no attempts to intra- or pre- op biopsy–it makes no difference, because whatever it is needs to come out anyway if resection is possible. However, your pre-op CT scan, my biggest pet peeve, was useless, and you sghould have been able to predict that it would be useless before getting it! Your only flaw in an other wise perfect case was that–altho I guess we should know th epathology first. CT is way overused in the workup of this typeical example of new obstructive jaundice–it can show you NOTHING that will be of use to you, knowing that as soon as you determine it is obstructive ( and the physical exam with Curvoisier’s sign, acholic stools and the U/S showing dilated ducts does that completely) the patient is headed to surgery–you will see everything- -and more–at surgery that you can possibly see with a CT–it won’t stop you from doing surgery, has no demonstrated reliability at all in determing resectability, beyond what the U/S shows–liver mets will show up fine on U/S but those should not change your approach to surgical resection anyway, just as they wouldn’t if this were colon Ca! Seeing a “mass” in the pancreas means nothing–in fact, the most resectable and curable cases are those with a very small tumor that the CT won’t show, so a “negative” CT means nothing, just as a “positive” ct means nothing–your case shows this beautifully, in that it didn’t change a thing you did! A waste of money, and flawed thinking amd flawed understanding of this disease to even order it! I’m sure many of you out there will disagree with this, but let’s see any data otherwise, and please explain to me how I have yet to EVER in my 15 years working up obstructive jaundice and doing surgery on periampullary cancers ever needed a CT yet to make my operative decision–not that CT’s aren’t usually gotten by the referring docs, but in those cases they usually not only don’t help, but many times lead the uninformed docs down the exact wrong path– like NOT consulting a surgeon when no pancreatic mass is seen!